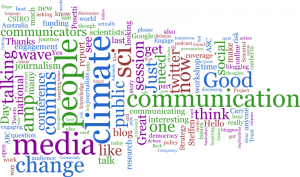 Our recent word cloud of the Australian Science Communicators’ Conference Tweets has raised a question: what is the role of non-traditional visualisations in modern science communication? We all know the value of graphs and maps, but what can we achieve with other visualisations, such as word clouds, network charts, flow charts and so on? What about online only motion charts, as seen in Gapminder? What do you like about these forms? What don’t you like? Does a word cloud or an online only motion chart have a role in an academic journal article? What are your favourite new forms of visualisation? Where do you see the future in visualisation?